At 15, a time marked by my peroxide bleached hair, terrible 80’s music, and my ginormous crush on my cousin’s best friend Bob, I was a bridesmaid for the very first time. On a lovely August day, my cousin Tony married his long time love Mary, in the chapel on the grounds of Boston College. As I remember it, most of that day was eclipsed in the little moments…walking down the aisle arm in arm with gorgeous, way out of reach, 24 year old, Bob, dancing with him… the stupid things I said during the dance, etc. For me, the day was a dream. And for our family, unlike the gathering that preceded it, it was a peaceful one. The bride was thrilled with everything… that is, except her cake. She expected an all white, buttercream iced wedding cake, and instead, got lots of light piped pink trim. 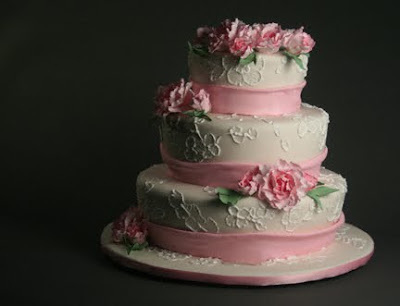 Hey, I had to wear pink… why not the cake? But Mary was appalled. How dare they!!! 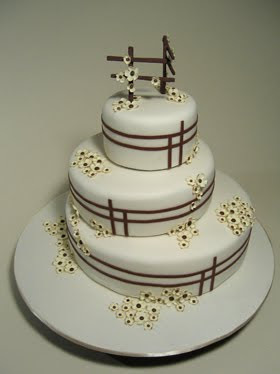 To my cousin Mary, wedding cakes were white. Personal tastes, expectations, images from the past… we all have an ideal. Few are shared. If you are coming to Sugar Couture for a wedding cake, its because you’re looking for your ideal, and this is why I avoided creating a section on my website devoted exclusively to wedding cakes, instead settling on the more apropos, ELEGANT. I’ve made cakes for sweet 16’s that couples have loved, ordering a variation for their wedding. 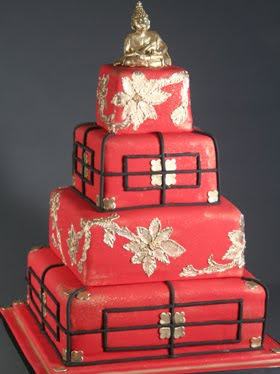 In May, I’ll be making a deep red and black cake for a lovely young couple with graphic tastes and bold tendencies, inspired by this 50th birthday cake I made for entrepreneur Russel Simmons- but without the Buddha topper! And even though a cake may be inspired by one I’ve already done, I never make exact copies. That is what factories are for. Below are some of my latest wedding cakes. They couldn’t be more different in terms of ideals, but what they all have in common, is their affinity to the lives they touch. Would you call them Wedding Cakes? 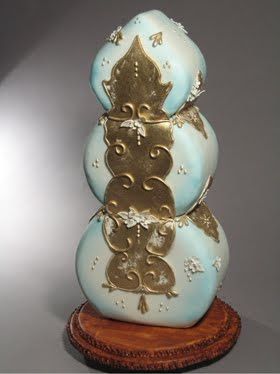 Elegant Cakes? Definition is up to you, creating something beautiful out of sugar that is inspired by your tastes and your story is up to me!